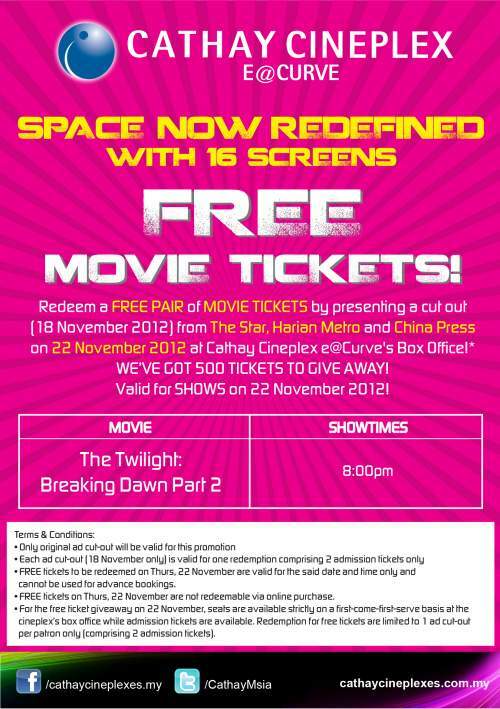 Redeem a FREE Pair of movie tickets by presenting a cut out (18 November 2012) from The Star, Harian Metro and China Press on 22 November 2012 at Cathay Cineplex e@Curve's Box Office! Valid for SHOWS on 22 November 2012! FREE tickets to be redeemed on Thurs, 22 Nov are valid for the said date and time only and cannot be used for advance bookings. For the free ticket giveaway on 22 Nov, seats are available strictly on a first-come-first-serve basis at the cineplex's box office while admission tickets are available. Redemption for free tickets are limited to 1 ad cut-out per patron only (comprising 2 admission tickets).